With the ease of access to the Internet these days, mobile sports betting for U.S. players has become somewhat of a necessity. Betting sites have been developing mobile sportsbooks for USA players that allow bettors to wager on sports from literally everywhere: the stadium, the bar, the bathroom, a restaurant, and anywhere else that takes them away from where they would normally use a desktop or laptop to make their wagers. Whether you’re using an iPhone, iPad, Android, or even some obscure BlackBerry device, there are mobile sports betting sites that accept US players who wish to wager via these phone and tablet devices. Exactly what mobile sports betting sites entail, how to access a mobile sportsbook, and which betting sites are compatible with your hardware/software are just a few of the things that will be discussed on this page. By the time you finish reading this, you will become well-versed on what options are offered to you from a mobile sports betting perspective. After all, sports betting is a regular thing, with everyday events to wager on all year round. As such, mobile betting gives you a huge edge, allowing you to place that perfect, timely bet no matter where else life takes you. What Exactly Is Mobile Sports Betting? Mobile sports betting is the ability to place wagers with your mobile device, such as through a smartphone or tablet with cellular or Wi-Fi Internet access. In reality, it is no different than regular computer-based sports betting, with the exception that you can do it on the go via your iPhone, iPad, or Android device. Thanks to the advances in technology and faster mobile connections, bookmakers have been able to create mobile versions of their websites. These are user-friendly for the majority of available commercial devices, with small-screen optimization and streamlined menu access. Beyond that, nothing is missing from what bettors would see if they were sitting on their computers at home; all the same betting lines are available, and new users are even able to sign up and deposit right through their phones. Bovada Sportsbook - Refer A Friend For $100 In Free Plays! Bovada’s mobile betting interface is the closest thing – visually – that you can get to a true sports betting app. Designed around and optimized for taps and swipes, the Bovada mobile site is simple and straightforward. You can find all of the day’s odds in a flash, and you can place your wagers with just a few natural gestures. If you need to top off your bankroll, claim a payout, or wish to participate in live betting, you can do all of that from your phone or tablet device. Bovada’s mobile interface looks perfect whether you’re using an iPhone or Android device, and you can even claim up to $100 for every friend you refer to Bovada’s award-winning sports betting service. Just open up your contacts, spread the word, and claim your bonuses! BetOnline Mobile - Leader In Mobile Sports Betting + Mobile Bet Bonus! BetOnline was one of the very first major US sportsbooks to offer smartphone and tablet betting via their mobile-optimized interface. You can’t download a specific iPhone or Android BetOnline app in the US, but because you can access the site’s full sportsbook from any modern smartphone, you can get an app-like experience without any superfluous, memory-hogging downloads, and you never have to worry about updates or security patches. BetOnline’s mobile sportsbook is easy to navigate, putting their entire book – including live betting – right at your fingertips. You can also access BetOnline’s other gambling products via mobile, including their fully-fledged casino, slots parlor, live poker room, and pari-mutuel racebook. Best of all, when you place your first mobile wager at BetOnline, you can claim a $50 free-play – if your first wager loses, you’ll be reimbursed for its value up to $50, making your first mobile bet a completely risk-free proposition. At SportsBetting, you already know you’re getting a world-class wagering experience. The sportsbook is considered one of the very best in the world, and it’s been serving US customers from all 50 states for well over a decade, all to rave reviews. SportsBetting offers action on every sport you can imagine, and all of their attractive lines and odds are front and center at their mobile portal. Thanks to an efficient interface, you can browse through the thousands of daily odds quickly and easily, and you can place your bets, claim your payouts, and manage your account on the go. New members who place their first mobile wager with SportsBetting can get a $50 mobile betting free-play bonus, and other bonuses can also be claimed from your iPhone or Android device. One of the most popular of these is the site’s $25 risk-free prop bet, which is perfect for expanding your horizons. After all, prop betting is the most entertaining type of sports wagering at SportsBetting, and every game has plenty of player and team props to choose from. 5DimesMobile - Alternate Lines + Reduced Juice On The Go! 5Dimes Sportsbook 5Dimes doesn’t have the most attractive mobile sportsbook, but it’s perfectly adequate and easy to navigate, allowing you to identify your best bets and place them quickly and easily. The best part of 5Dimes’ mobile experience, however, isn’t just the quality of their lines – it’s the fact that you’ve already got all the alternate lines set up and ready for any given contest. Unlike other books where you have to fumble with your phone to buy points, 5Dimes puts these right at the top, and all you’ve got to do is tap! While 5Dimes has several bonuses to choose from, nothing beats their Reduced Juice program, which is available to all members, and which you can activate via your iPhone or Android. Reduced Juice limits 5Dimes’ house take, reducing it by about half compared to other books. And that means more money in your pocket! BookMaker Mobile - Claim $600 In Cash Bonuses Via Mobile! BookMaker is the original online sportsbook, and it’s designed with seasoned bettors and high rollers in mind. That said, it’s still great for beginners, and it offers a number of unique features perfect for bettors of all experience levels and financial means. With BookMaker’s mobile-optimized interface, you can access every part of your account, and you can make high-dollar deposits in just a couple of taps. While BookMaker doesn’t offer any mobile-specific bonuses, their 15% welcome bonus is worth up to $600 in cash! This is better than a free-play bonus, as cash is more versatile, allowing you to spread your bankroll around to the site’s other gambling services. And all of these are available right on your iPhone or Android! BetDSI Mobile - New Mobile Sportsbook Is Better Than Ever! BetDSI’s mobile sportsbook has recently undergone a major facelift, making it a breeze to access their full menu of odds and props. BetDSI has been in the business for over 20 years, and they were one of the first to embrace mobile betting. But the new site is better than ever, and that means that it’s easier than ever to wager on all your favorite sports at this high-end, exclusive sports betting site. BetDSI doesn’t have many bonuses to choose from, but the ones they offer are huge, including a 100% New Member offer and up to $2500 in free-plays every time you fill up your account with fresh funds. All of which, of course, you can do from your smartphone or tablet! MyBookie is the newest sportsbook on our list of industry heavyweights, but even though they were only founded in 2014, they’ve already made big waves with their US-friendly betting options and their dedicated customer support. However, the best aspect of MyBookie is perhaps their mobile sportsbook interface, which brings all of their products to you, no matter where you are. Mobile betting is by far the most convenient way to wager, and MyBookie has nailed its sportsbook’s portable presentation, so you can bet with ease. 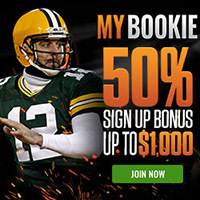 You can access all of MyBookie’s many promo offers right from your iPhone, iPad, or Android, including their 50% new member bonus, their 8% racebook rebate, and their 150% casino reload bonus. You can even enjoy their live casino games right from your mobile device, which is like keeping a real Vegas dealer right in your pocket! iPhone - The Apple iPhone is the device that most mobile sports betting sites are designed for. As such, you will have no trouble finding a USA online sportsbook compatible with your current iPhone. As long as your iPhone is reasonably current and receiving regular system updates, you will be able to use it to access any of our most recommended sportsbooks. That said, there are no official sports betting apps for offshore sportsbooks on the App Store, as Apple’s domestic US policy doesn’t allow these programs in their store. However, your mobile browser is more than capable, and all major online books are optimized for Mobile Safari. Android - Now the biggest player in the smartphone market, mobile sportsbooks would be making a huge mistake to exclude Android users. If you own a reasonably current Android handset and cannot access your chosen bookmaker with it...you don’t need a new phone, you need a new bookmaker. All of our top choices for mobile sportsbooks support the last several versions of the Android OS. Like Apple, Google does not allow official sports betting apps for overseas books to be downloaded from its Google Play store, but you don’t need a dedicated app when the Chrome browser can handle every mobile site out there. iPad - Just like the iPhone, the iPad works great when used for live betting. While larger than its counterpart, the iPad is a great option for live betting because of this very reason, as you can catch temporary, short-lived odds faster on the device’s bigger screen. BlackBerry - This device is a tricky beast because there have been so many versions and there’s only limited support anymore. It's hard to say if your particular BlackBerry is compatible with any mobile sports betting site, though if you have a modern browser on your BB you should at least be able to access the full version of any site and make wagers that way. Windows Phone - While the Windows smartphone platform is waning in popularity, it’s still being used by millions of Americans. While its display constraints aren’t a special consideration for developers or webmasters, you can still use your Windows Phone to make wagers through the normal desktop betting portal of your favorite sportsbook. Other Internet-Capable Devices - We can only say that this will depend on the browser and software installed on your device. If you're using an Android-powered tablet, then you will have no problem. If you're trying to access betting sites through your e-reader or similar device, it probably won’t work. It doesn't hurt to try, of course, and even if you need to sign up for an account, everything is always free. Pay no money until you decide to deposit! Convenience - Mobile betting allows you to access the sportsbook from wherever you are, and you can easily place wagers from the palm of your hand. It only takes a few seconds to place a sports bet on a mobile sports betting app (or, more accurately, a sports betting web-app). No Download - You do not have to download anything to use these mobile sports betting sites. They pop up automatically when you visit your sportsbook site from your device through its mobile web browser. You never have to worry about security patches or updates, either, as these are all handled server-side. All Betting Lines Are Offered - The mobile sites for all the top sportsbooks offer the full extent of the betting lines + sports wager types, and these include full live wagering, as well. You are not restricted to a different menu of odds by using any mobile sports betting site. Compatible With Most Mobile Devices - Whether you have an iPhone, Android, iPad, Blackberry, or other tablet, you can have access to these mobile sports betting sites. As long as your wireless device has a modern, current web browser and a good Internet connection, you’re good to go. All Features Come With Mobile Site - You get everything from the mobile sports betting site of your chosen sportsbook that you do via the desktop version you’re used to. If you can do it on a PC or Mac, you can do it on your mobile! From time to time, some websites introduce free sports betting bonuses exclusively for players that take advantage of the mobile version of the online sportsbook. This is in an attempt to drive traffic to that portion of their product which really expands their footprint. Unfortunately, not everyone is in the know about mobile betting, but those who are can benefit from $10 or $50 in free bets given to users. This is especially true if those bonuses are used to win more money for even bigger sportsbook payouts, all by just betting via the mobile website! Synopsis Of Mobile Sports Betting In The U.S. Mobile sports betting is certainly the future of USA online sportsbooks, as they are able to bring their services to even more devices and draw more USA players into the fold. USA mobile sports betting sites and their American customers are both happy with this arrangement, and therefore word spreads; before you know it, everyone is jumping in on the action! The bottom line is that almost everyone that gives it a try loves mobile sports betting provided that they have a good network connection. What you may find is that you ditch betting on your home computer altogether. It really is convenient to wager via your mobile device, and bigger displays, more powerful hardware, etc. all only contribute to the list of reasons why folks want to bet sports on their phones or tablets rather than firing up the ol’ desktop or lapper.